I believe that voting entails responsibility. Not that it is a responsibility – that's assumed – but that casting your vote for a person indicates an endorsement of their actions that carries moral weight. That's a complicated thing to say, of course, since the role of electoral strategy and the near-meaninglessness of any single vote means that the moral consequence of voting is neither a sufficient nor a necessary expression (particularly in a place like CT or DC). But as the most explicit method of participation in government, the only act of self-governance on the national level for the vast majority of the populace, it is unavoidably significant. It matters who you vote for. Because of this belief, I found myself embroiled, three months ago, in one of the fiercest political arguments of my life. It was probably deserved: I'd just announced my tentative decision not to vote for Barack Obama, and was defending myself against friends of the most unmixed partisan Democratic variety. Despite my support during the primaries, and fervent hope that he would prevail over John McCain in the general, the fact that Obama and I disagree, or insufficiently agree, about so many of the most important of today's issues was enough to make me worry about the consequences of his presidency and the endorsement that my vote would entail. This is my patriotism: the decision to take personal responsibility for what my country will do over the next four years, should Obama win. 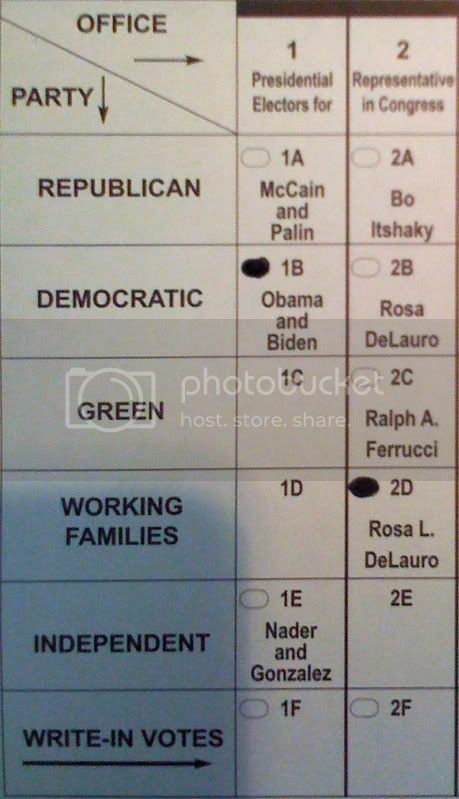 I didn't have to, since a downticket-only vote in Connecticut would probably have meant as much as a fully Democratic/Working Families ballot. But it's time to step up. This country is mine, as much as anyone's, and there's less of a reason to be ashamed of that fact with Obama in the White House. I'm sure I'll look like an idiot in a year or so, but I do feel, for a change, that this is not merely a choice between two evils. This was a really amazing campaign. Great post! I LOVE that you voted the Working Families line. I think they will come out well in this election. WHERE IS OUR LIVE BLOGGING???? ?